Discover the Demonstrator Scrapbook Starter Kit. I am so excited to tell you about this Scrapbook Starter Kit. It lets all of you who have been wishing you could join Stampin' Up as an Independent Demonstrator, achieve your dreams at a never before seen entry price. What does the kit allow you to do? - and the ability to develop a business or become the type of demonstrator that you'd really like to be. You could earn extra income teaching and demonstrating a variety of paper crafts. Providing classes and conducting demonstrations will help you sell the products, which in turn will boost your income. Maybe you'd love to be part of a scrapbook club or group. This Starter Kit will lead you to the tools to form your own group or be the envy of other group members because you get everything at 20% discount. You'll meet new friends with similar interests and learn lots of new techniques and design ideas. Many Stampin' Up customers have a desire to join the company because they know the quality of the products is second to none. They know the stamp designs are industry leading and award winning. They also know that the system of co-ordinating inks, accessories and card stock lets, no helps, crafters to achieve excellent results. You wont be restricted to scrap-booking. Once you've joined the group you can go ahead and use these fabulous products for cards, boxes and other paper crafts. If you're a little stuck for ideas, you'll have access to all the fantastic ideas on the demonstrator web site and from other team members. Will you have ALL the benefits that a regular demonstrator enjoys? YES - You'll have access to all the regular discounts, commissions, promotions, training and business supplies of a regular Stampin Up Independent Demonstrator. Because this is a Scrapbook Starter Kit you won't be doubling up on items you already own. Each item is interchangeable for another of the same price. So you may like to change the ink pad to a green, choose a different Simply Scrappin Kit, or change the colour family of the 12 x 12 card stock. If you are not a scrapper you can use all these items to create stunning (and quick) cards. Don't delay - this opportunity is available for one month only. 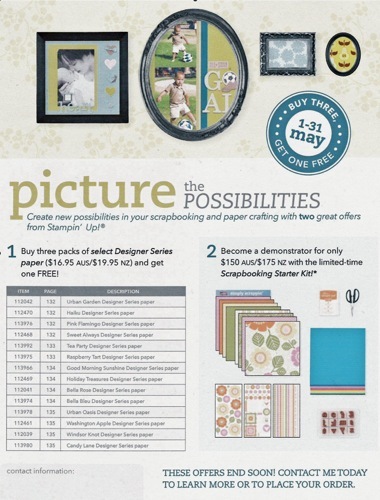 May is Scrapbook month, and when May finishes so does this excellent opportunity. The offer is restricted to Australian residents. Read the brochure now and contact me today for more information. I'd love to welcome you to my team of friendly stampers and scrappers, who will provide you with support and friendship, so take the first step and enquire about this opportunity This promotion will help you achieve your aims. For the small, once only cost of $150.00 you can gain all the benefits available to every member of the Stampin Up family. Remember there are only 31 days for you to take advantage of this fantastic offer. You will be pleased you took the opportunity while it was available. So for the first time (and probably the last) you'll pay just $150.00 to become a Stampin' Up Demonstrator with all the benefits and assistance that goes with the title. In addition to the Starter Kit Opportunity, Stampin Up has another great offer to help celebrate Scrapbooking Month. Buy three packs of selected Designer Series Papers and get a fourth pack absolutely free. That is a saving of $16.95 so join with a friend or two and place your orders during May. You can use the above Contact form to place an order, but again be quick as time may run out.